The Film Committee has been cohosting events with the Tokyo International Film Festival (TIFF) at FCCJ for nearly a decade, but the past two years have been especially exciting for us, thanks to TIFF’s newfound focus on Japanese film. 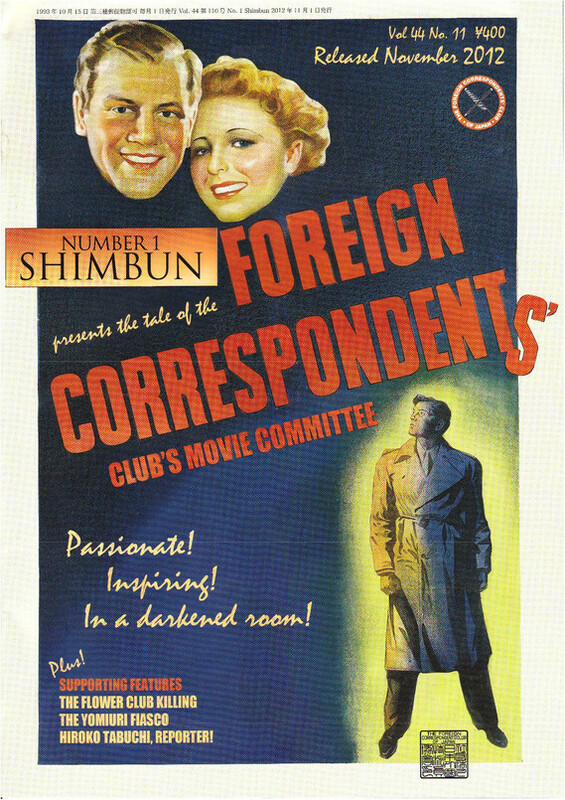 Anyone who has attended FCCJ’s screenings over the past nine years knows that our emphasis is on introducing Japanese films and filmmakers to international audiences through the Tokyo-based journalists, critics, festival programmers and cinéphiles who join us for our events. In 2015, TIFF established two new sections devoted to Japanese film, Japanese Classics and Japan Now, and included nearly 80 Japanese films across all the sections in its lineup. This year’s 29th iteration of the festival will be equally Japan-centric, with two local titles in the main Competition selection and dozens more in the Special Screenings, Asian Future, Japanese Cinema Splash and other sections. Among the highlights will be the world premiere of the first TIFF-Japan Foundation international coproduction, Asian Three-Fold Mirror: Reflections, a special Kabukiza program with kabuki performance and film screenings accompanied by a benshi narrator, and personal appearances in The World of Mamoru Hosoda tribute. Among this embarrassment of riches, our heart still belongs to the Japan Now section, presided over by Program Advisor Kohei Ando. A genius at selecting the most piquant, provocative, evocative films among those that hit Japanese theaters during the year, Ando has also made another brilliant choice for the section’s Director in Focus: acclaimed creative force Shunji Iwai. Despite being one of Japan’s most famous exports — especially in Asia, where new Iwai releases are trumpeted like the Second Coming — Iwai has not yet been the subject of a career retrospective in his own country. Ando and TIFF are correcting that. Japan Now will be featuring five Iwai films, including the 1993 work that kicked off his career, Fireworks: Should We See It from the Side or the Bottom?, and his latest hit, the enchantingly enigmatic A Bride for Rip Van Winkle (2016) in the festival’s mini-tribute, with Iwai on hand for Q&A sessions. Iwai and Ando appeared at FCCJ to discuss details of the tribute, along with TIFF Director General Yasushi Shiina. The evening then continued with a special screening of A Bride for Rip Van Winkle and an hour-long Q&A session with Iwai. The Japan Now Director in Focus tribute allows Ando to help expand the overseas recognition of midcareer creators like Iwai, whose groundbreaking style and youth-focused vision have been internationally acclaimed in such masterworks as Love Letter (1995), Swallowtail Butterfly (1996), All About Lily Chou-Chou (2001) and Hana and Alice (2004). Iwai is the only Japanese director who has shot films in New York (for the 2008 omnibus New York, I Love You), Paris (as producer of the 2010 I Need to Buy New Shoes) and Vancouver (his 2011 English-language debut, Vampire). In a career of infinite variety, he has also written novels and made an animated feature (The Case of Hana and Alice, 2015), documentaries (The Kon Ichikawa Story in 2006; Friends After 3.11, about the long-lasting devastation in Fukushima), as well as dozens of much-imitated music videos. Iwai was clearly relaxed at FCCJ, too, and was extremely generous with his time during the Q&A session that followed A Bride for Rip Van Winkle. Returning to the dais once again to chat with the large audience (many of whom had been there for 4 hours) after the screening, he spoke in both Japanese and English on a range of subjects related to the film, from casting to inspirations to censorship to the film’s apparent criticisms of societal issues. Adapted from Iwai’s own novel of the same name, the film returns to the aching melancholy of several earlier romances, but introduces new notes of cynicism. Nanami (Silver Bear-winning actress Haru Kuroki) has been sleepwalking through life, her docility and submissiveness almost terrifying to behold. Like the legend of Rip Van Winkle, in which the protagonist awakens after 20 years to an unfamiliar world, she is about to be rudely shaken out of her slumber. A lost soul whose loneliness makes her deeply gullible, she is only able to express herself by adopting another identity on the social network Planet. On the site, she meets a fellow teacher and they soon plan to wed, although we learn that she has divorced parents, no interaction with relatives, and no friends she can invite to the reception. Through Planet, she meets jack-of-all-trades Amuro (Go Ayano), who provides actors to play her family at the wedding. Her marriage thus begins with an innocent-seeming deception, and sure enough, it begins to unravel. Nanami turns to Amuro again when she suspects her husband is cheating and he continues to appear whenever Nanami’s in need, rescuing her for a hefty fee. Eventually, he finds her a job in an enormous mansion, which she shares with the outgoing Mashiro (Cocco). The two women bond tightly in this otherworldly setting, becoming the sisters and friends that neither has. But who is its owner and why have they really been brought there…? Only a creator of Iwai’s stature could possibly devise such incredibly intricate plot machinations from the name on a store window, and assemble them so they unfold in such deliciously ambiguous — and unexpectedly moving — ways. But A Bride for Rip Van Winkle reminds us once again that he is one of cinema’s most masterful storytellers.